I visited during the winter off-season, as part of a visit to the charming Stewart Island, which is off the bottom of the south island near Invercargill. 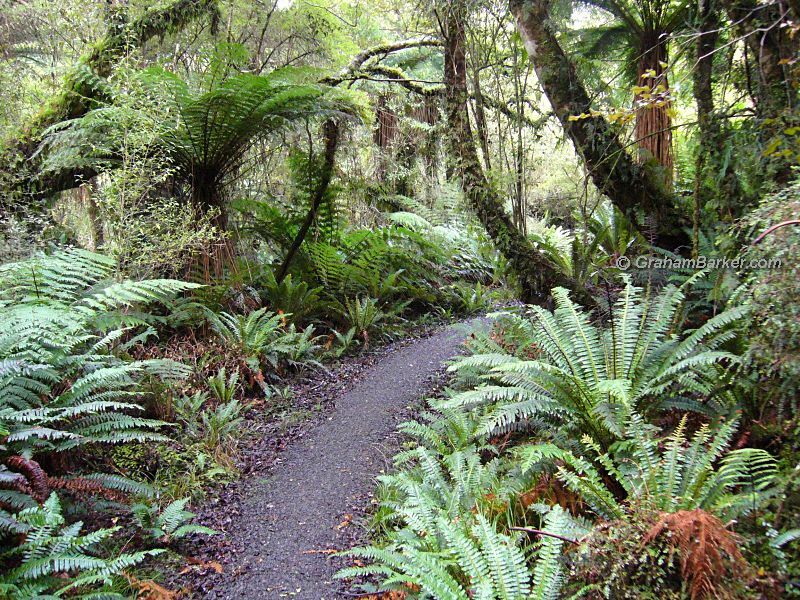 What attracted me to the Rakiura Track was its "easy" grading and the length of 36km, which can be done comfortably in three days. As a person of questionable fitness I thought this would be a much kinder introduction to hiking in New Zealand than the more demanding tracks on the mainland. The Rakiura Track is a circular route, beginning and ending at the island's only settlement at Halfmoon Bay, so no transport is needed. My hike began as soon as I had registered at the DOC office and paid the hut fees. The first and last sections follow sealed roads, but they are extremely quiet - I don't remember seeing any traffic on my walk. I decided to walk anticlockwise, which meant the first day's walk was north along the coast on mostly excellent surfaces. There was a little beach walking, some panoramic coastal views, and plenty of deliciously lush rimu and kamahi forest to relax in. Also a swing bridge which threatened my fear of heights, even though I new it was well built and perfectly safe. A paved path - luxury! The second day was mostly forested hills, and provided the bulk of the track's uphill walking. By New Zealand standards the hills are small, but for the unfit they are still tiring enough! The extensive view from the track's high point, over Paterson Inlet and the wilderness beyond, compensated for the perspiration. Day three provided more exquisite forest, skirting deserted silent inlets and gentle hills before re-entering town from the west. 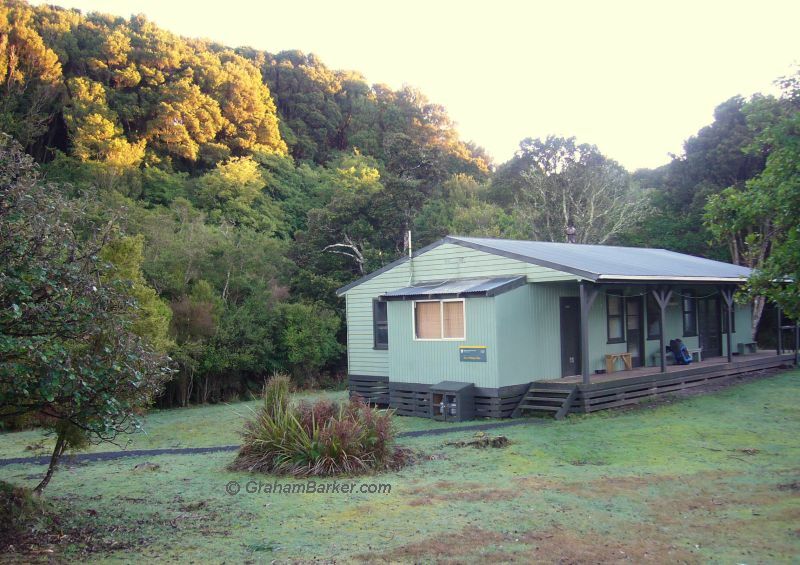 Both nights of the walk were spent in very well equipped huts - sheer luxury if you're used to walking in Australia where huts are comparatively rare. I never quite managed to get the stoves lit, but thanks to the wonders of thermal underwear the huts felt cosy enough without heating. Overall it was an excellent experience, my only grumble (and it's only a little one) being the striking difference in track quality between the east section and the rest. The deterioration from paved gravel, stones and boardwalk on day one to bare mud and tree roots on day two gave the impression the track was still under construction. It seemed odd that a track rated top standard could vary so much, but this was overshadowed by the pure charm of the environment. As for the track's official grading as "easy" ... it may be easy compared to other NZ tracks, but the effort required is not to be sneezed at when you're carrying a backpack. If you're fit and hike regularly it may well seem easy. On the other hand, sedentary workers who hike once per year can find it tiring ... but not too much to enjoy it. I walked this three day hike in winter and had it almost to myself; the quietness and solitude enhanced my enjoyment of what is mostly wilderness with little evidence of human interference. I also enjoyed mostly dry weather which contradicted the island's reputation for being wet all the time - this reputation is undeserved, though it's still wise to take wet weather gear. It may not rain all the time, but it still rains frequently. 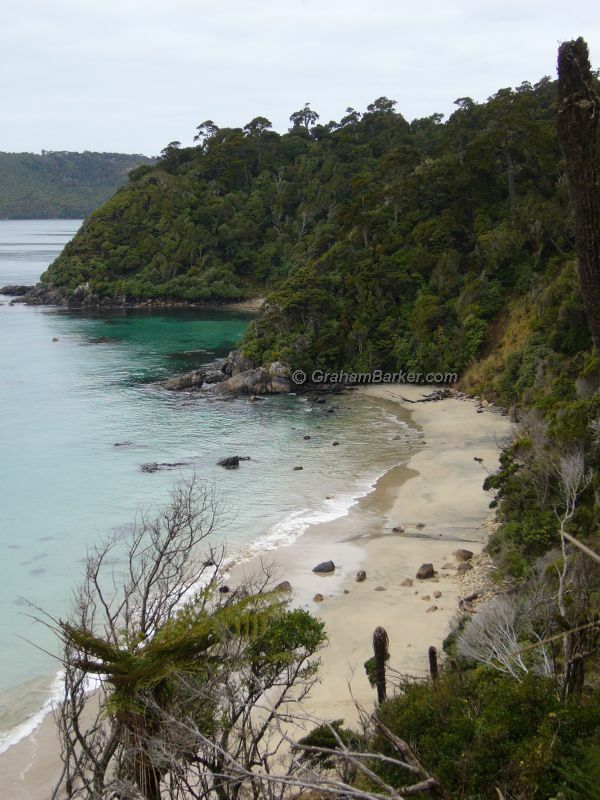 The Rakiura Track shows what much of New Zealand was like before 90% of its forests were destroyed. If you want to do a multi-day hike in New Zealand, but prefer something less demanding than the better known tracks, and away from the crowds, then the Rakiura Track is worth considering.